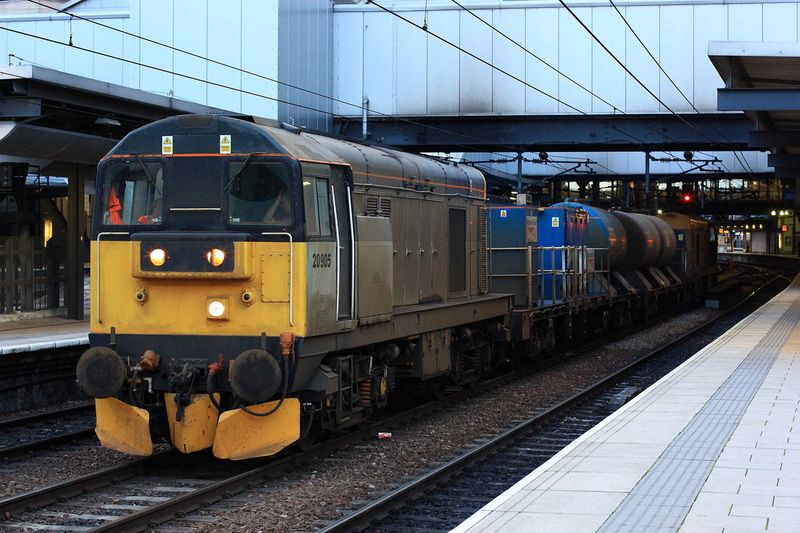 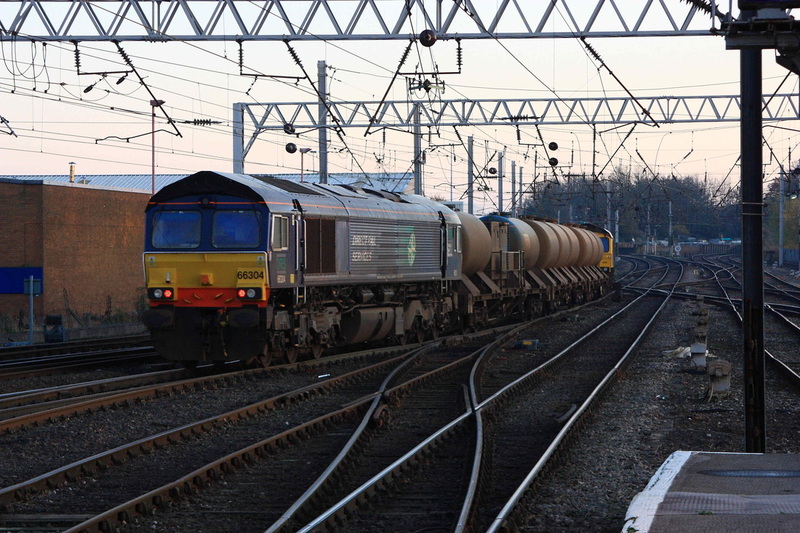 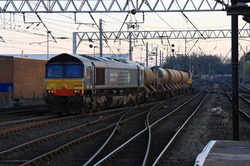 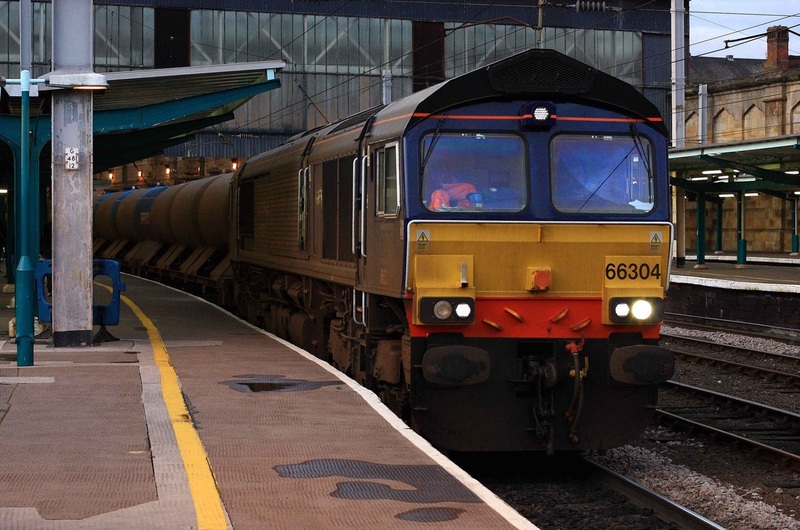 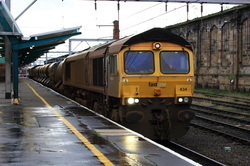 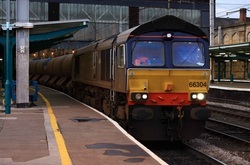 The First Treatment train stands at Carlisle with a filthy 66434 at the head of 3J11, Kingmoor to Kingmoor via S & C, Hellifield, Blackburn, Carnforth and WCML. 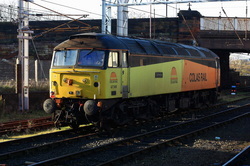 The tail loco was 66304. Pretendalino empty stock is propelled by Freightliner Powerhaul 90049. 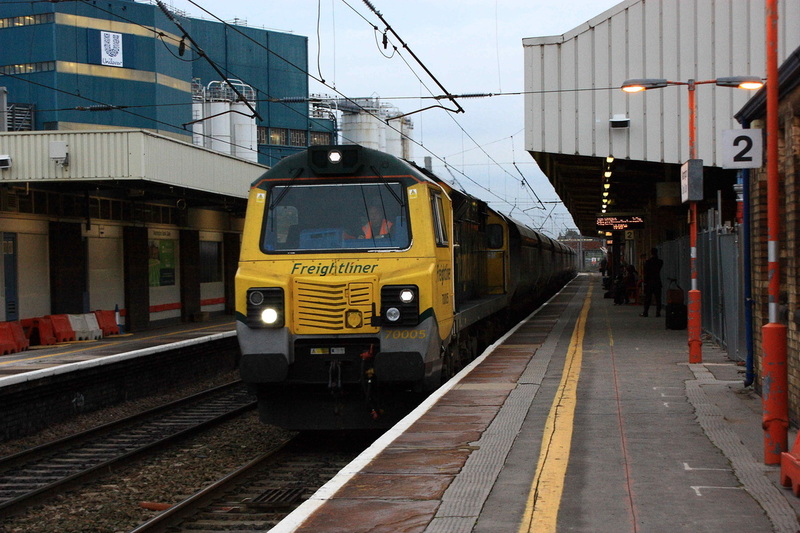 The working was 5T92 back to London Willesden. 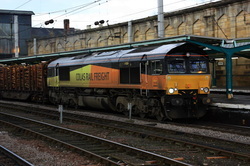 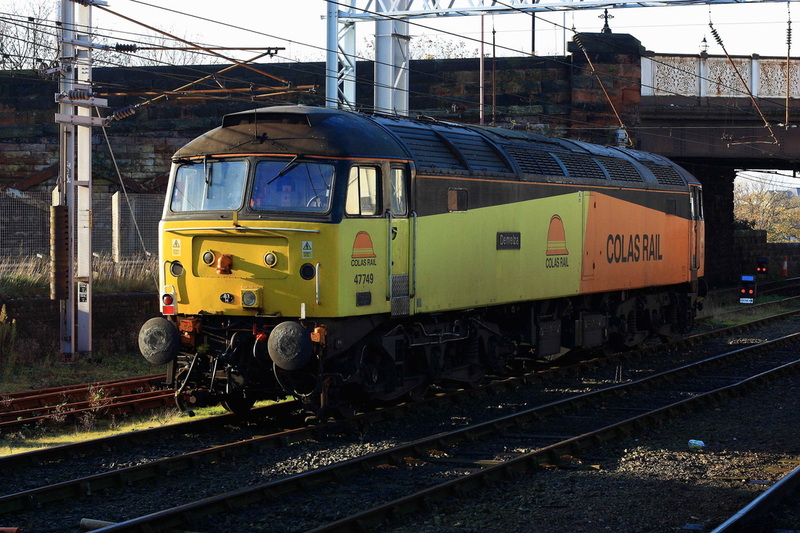 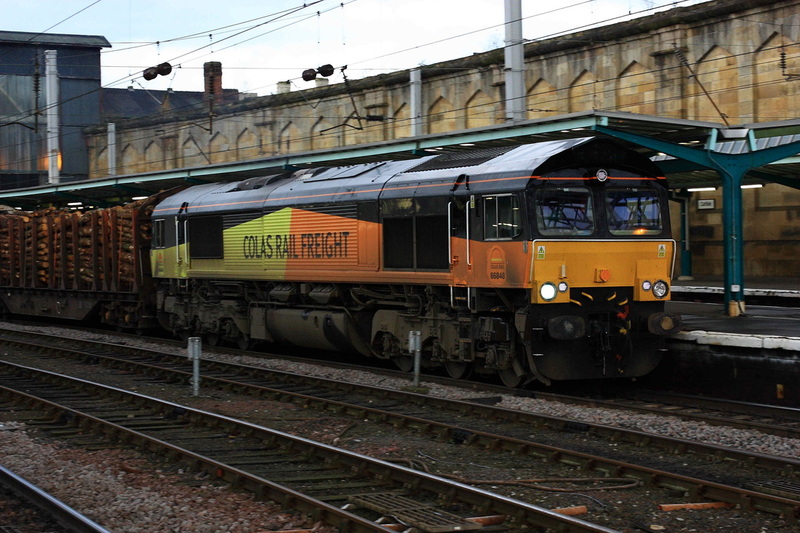 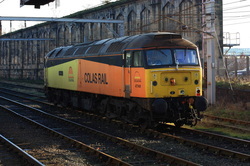 Colas 66848 passes Carlisle with the loaded 6J37 Carlisle-Chirk timber train. 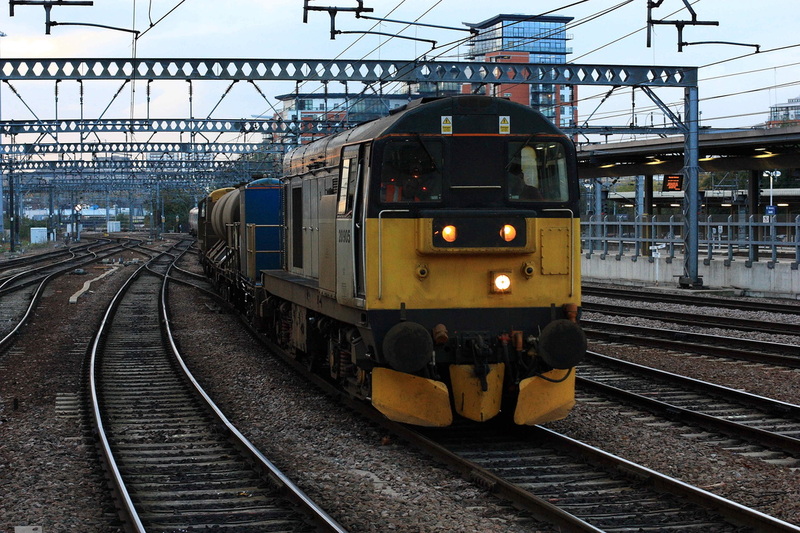 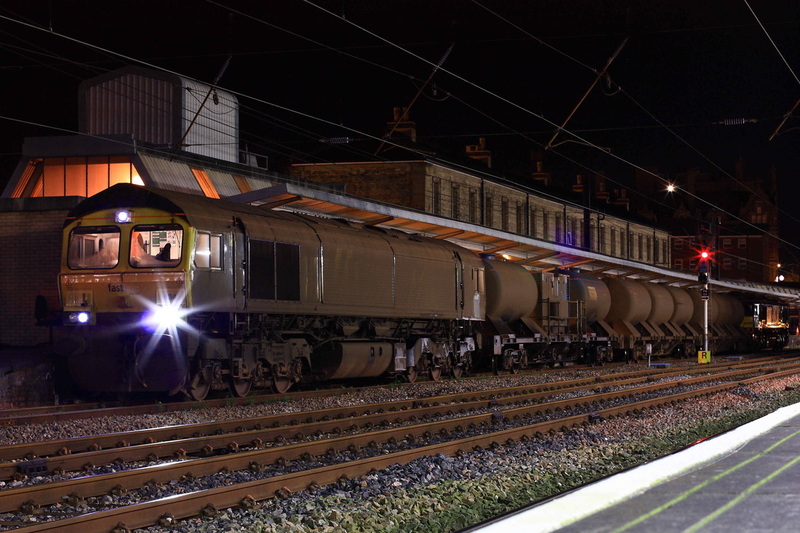 A shot of 66304 which had been previously tailing 3J11 RHTT, about to head for the S & C for the start of the night shift. with Flying Scotsman 91101 propelling the service away from Leeds. 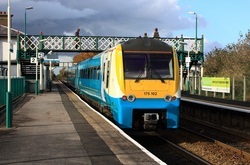 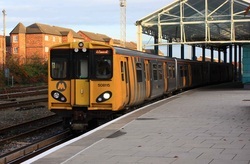 Grand Central 180107 departs from Wakefield Kirkgate. 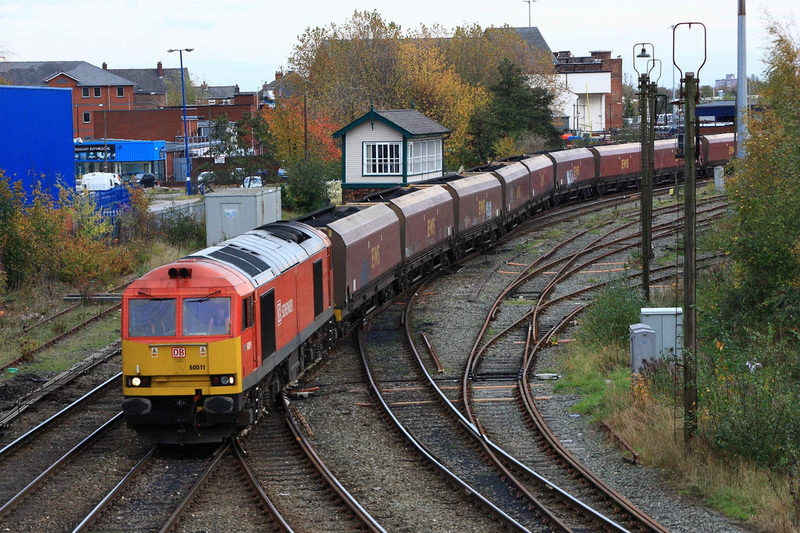 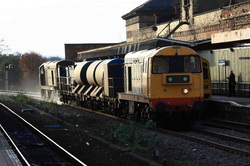 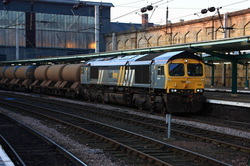 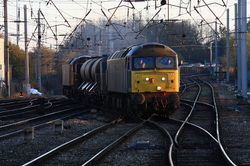 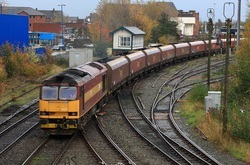 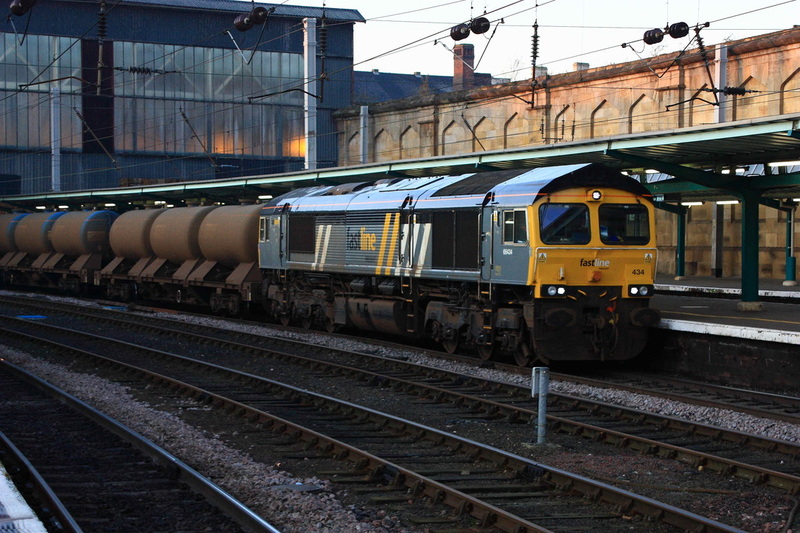 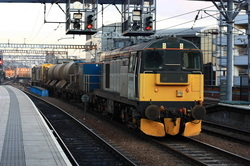 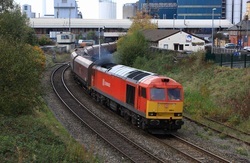 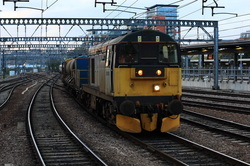 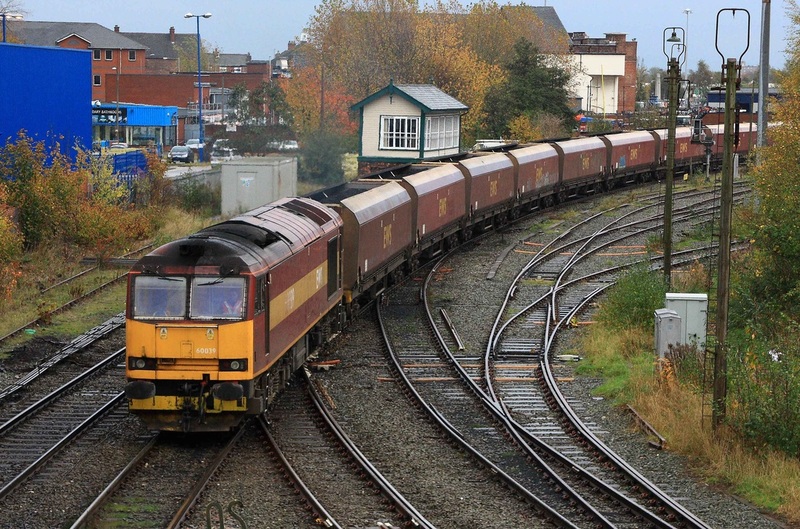 66545 enters Kirkgate with 6M05 Roxby-Northenden containerised waste. 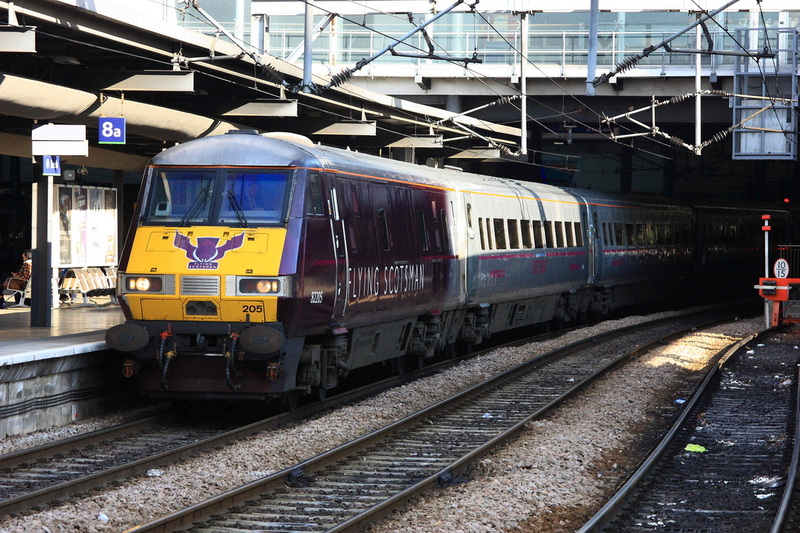 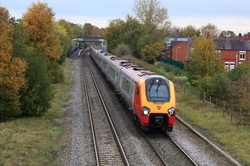 East Coast DVT 82211 leads the 14.15 departure from Leeds-King's Cross into Wakefield Westgate. 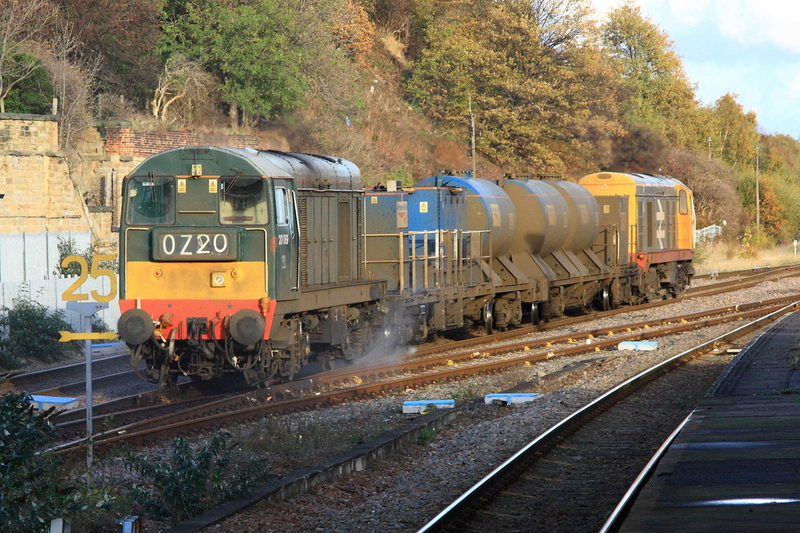 Note the black burn marks on the lower body and skirt at the 2nd mans side. 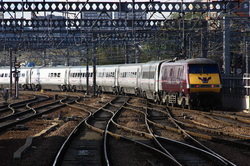 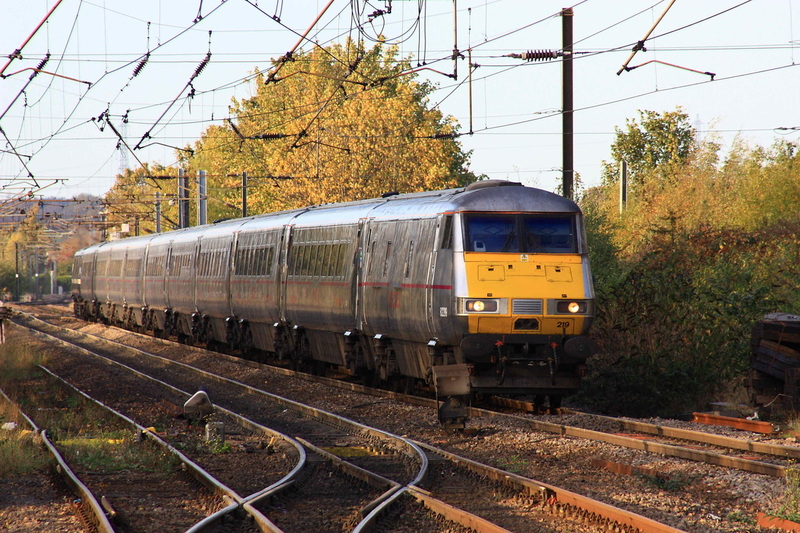 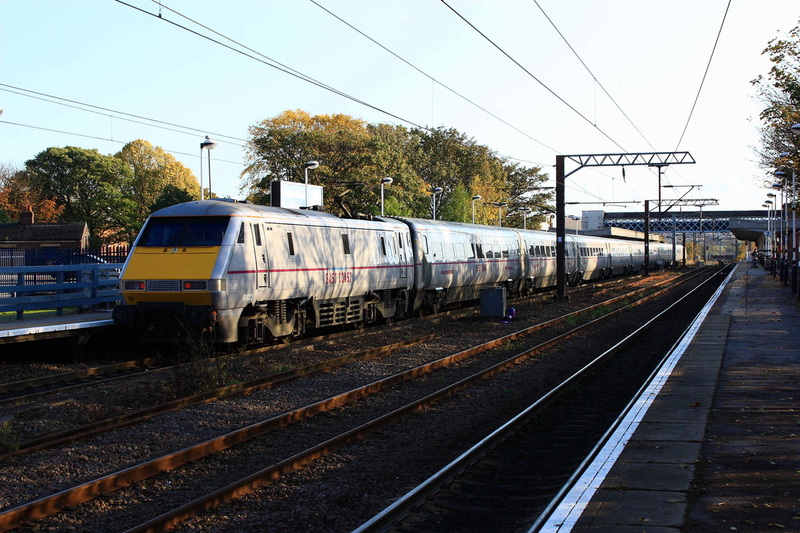 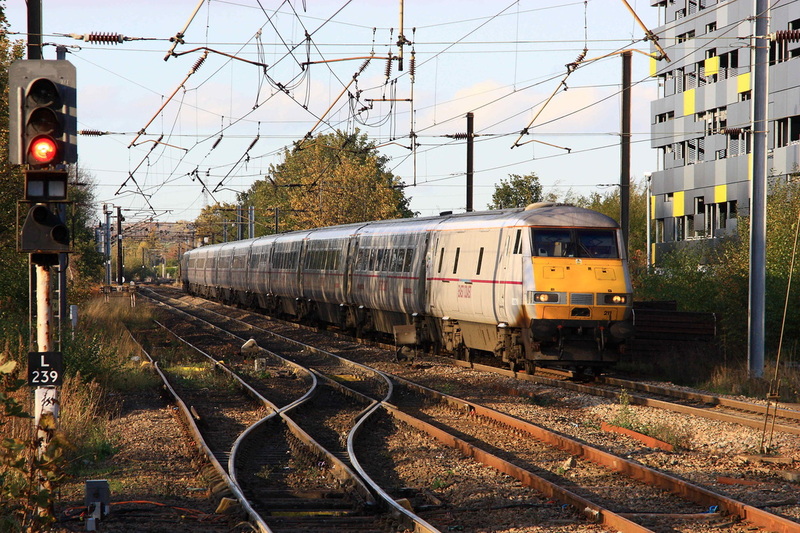 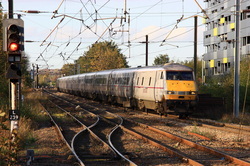 East Coast 91122 departs Wakefield Westgate with the 14.15 Leeds-King's Cross service. 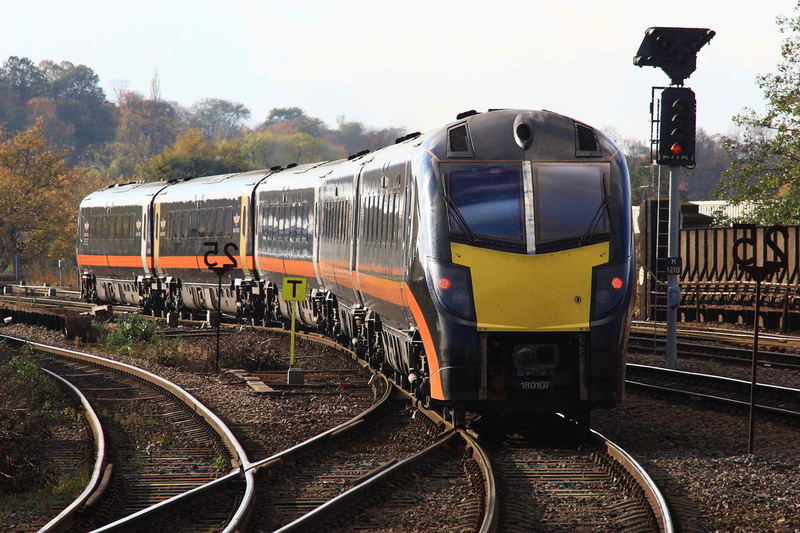 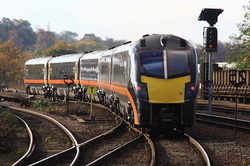 The set of stock, DVT and loco were all in matching East Coast Grey livery. 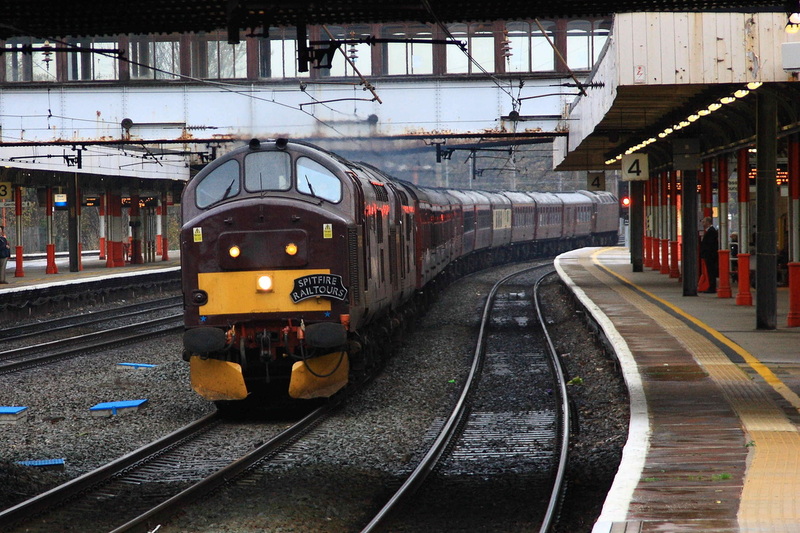 DVT 82219 enters Westgate leading a rake of East Caost Liveried stock and a Blue rebranded 91 on the back. 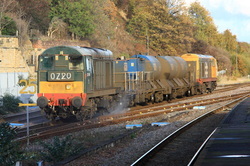 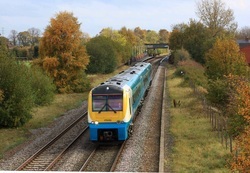 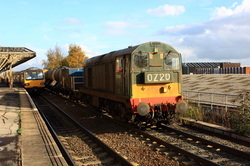 Harry Needles Class 20s have been hired in for the RHTT workings, with 2 pairs on the Yorkshire circuits. 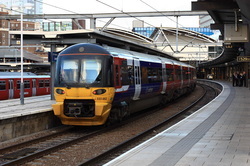 20901 leads 20905 with 3S21, awaiting departure from Leeds. 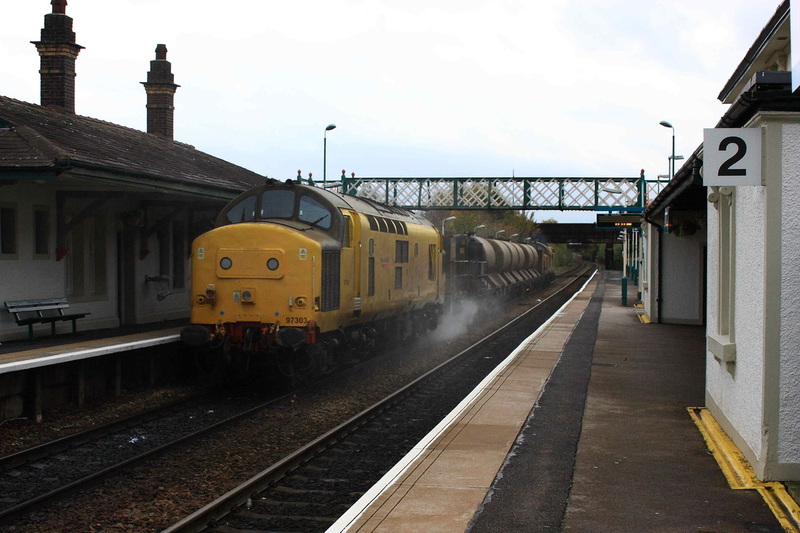 20901 pulls away with a bit of clag. 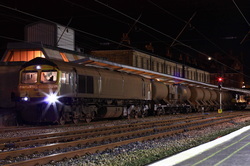 Night-time at Preston, and 66434 sits in the PCD platforms with 3J11. 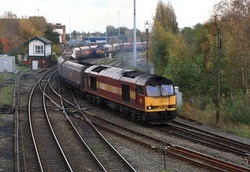 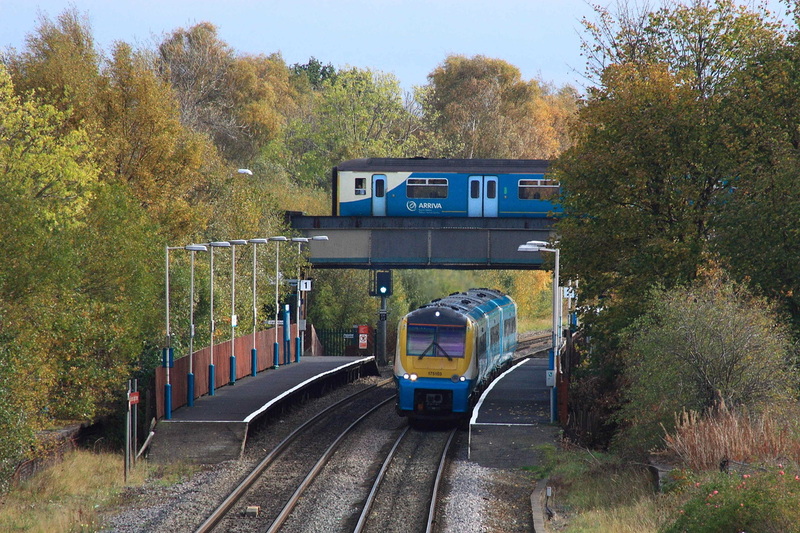 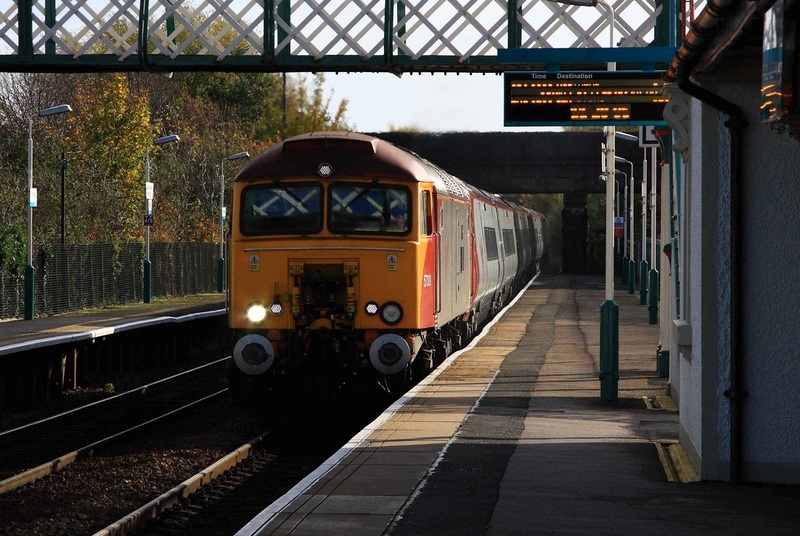 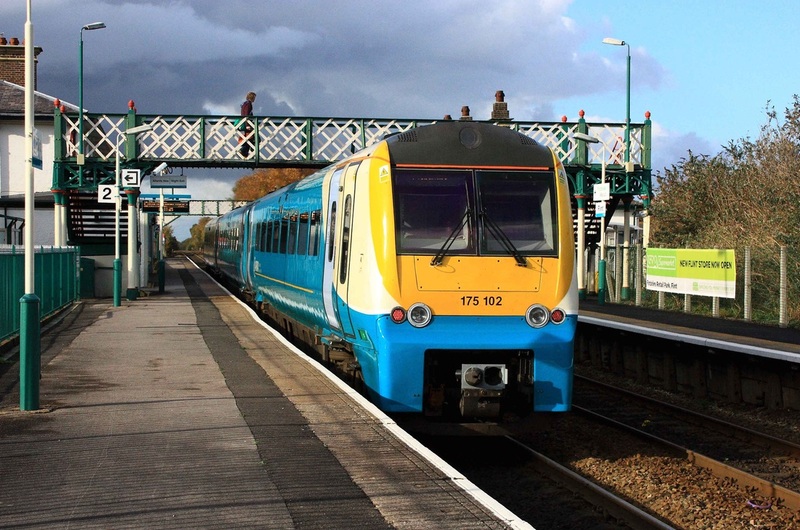 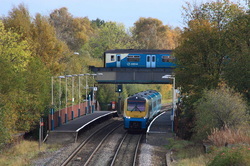 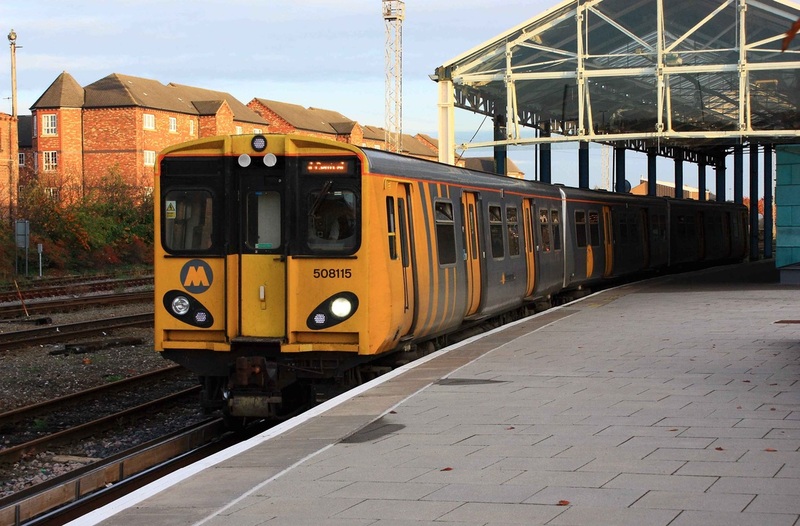 3s71 heads for Shotton with Network Rails 97302 leading 97303. 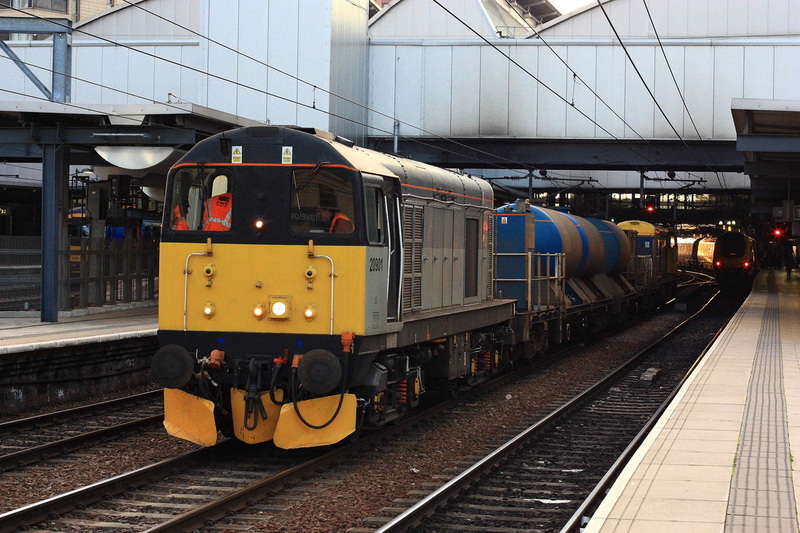 This train was not exactly hanging about! 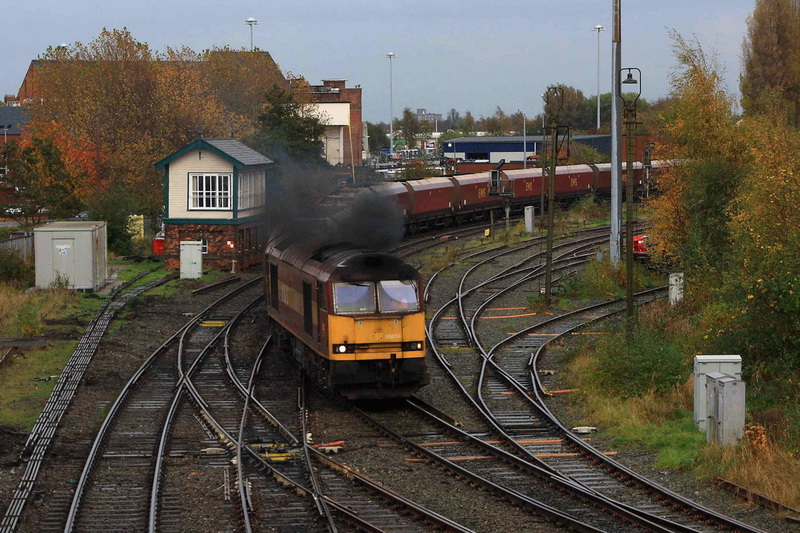 And back to Slutchers Lane with 60010 departing Latchford sidings. Whilst shortly afterwards, DBS 60011 heads for Fiddlers Ferry Power Station with loaded hoppers. 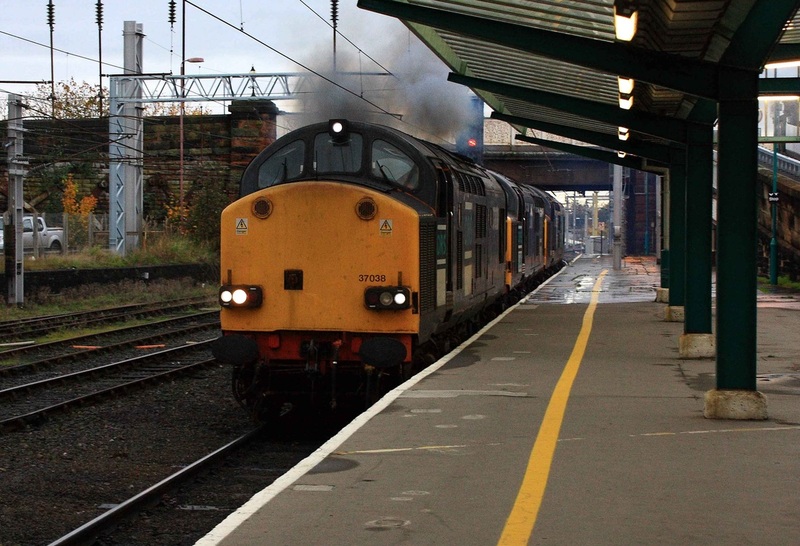 Pretty much bowled by the train I had just got off, and running over 2 hours early, 97303 tails 97304 on 3S71 seen here passing Flint, heading back to Crewe. 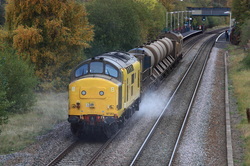 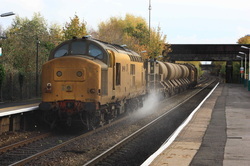 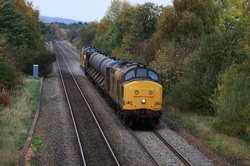 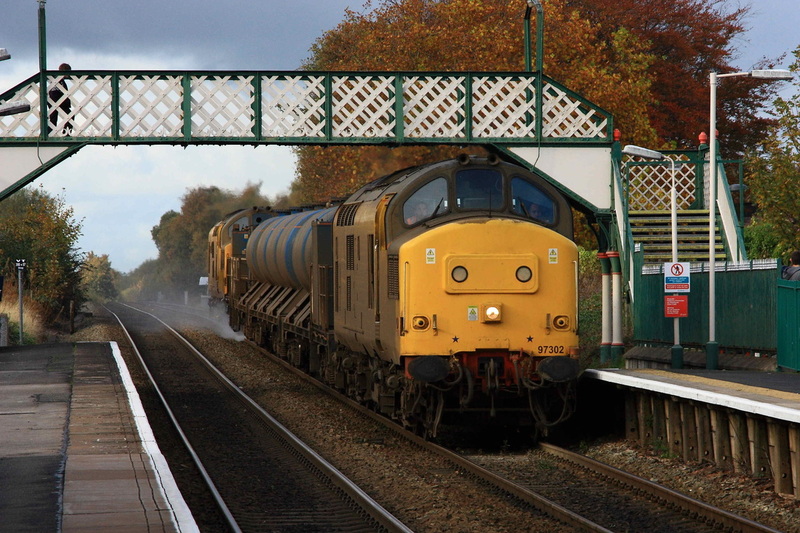 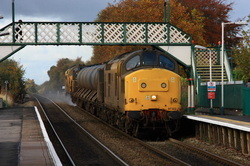 60010 clags away as she departs Latchford with the empties from Fiddlers Ferry. 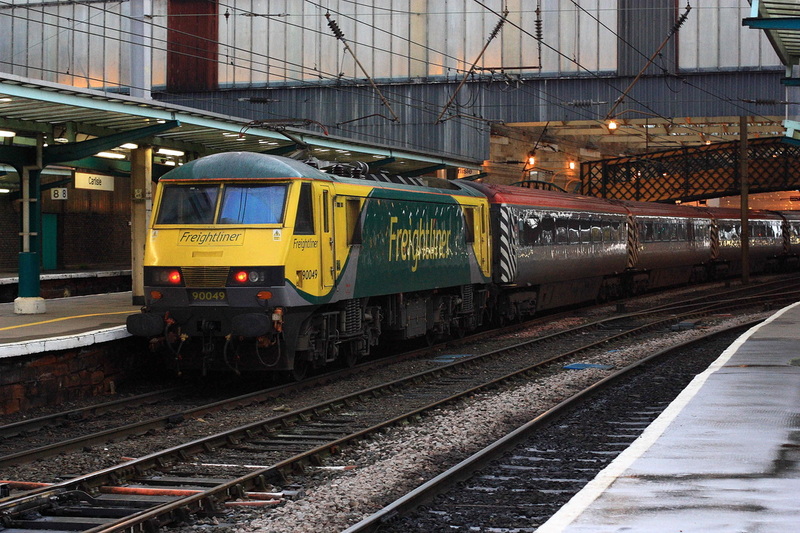 New kid on the block, with 60039 heading for FFPS, about to head under Warrington Bank Quay station. 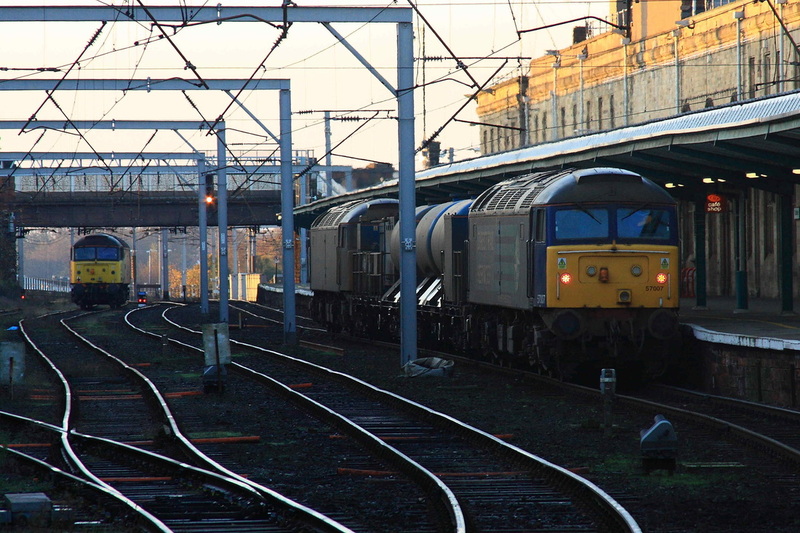 Prior to heading to Yorkshire, 37685 and 37676 bring the empty stock through Lancaster for the Spitfire Railtour's positioning working from Preston to Exeter. 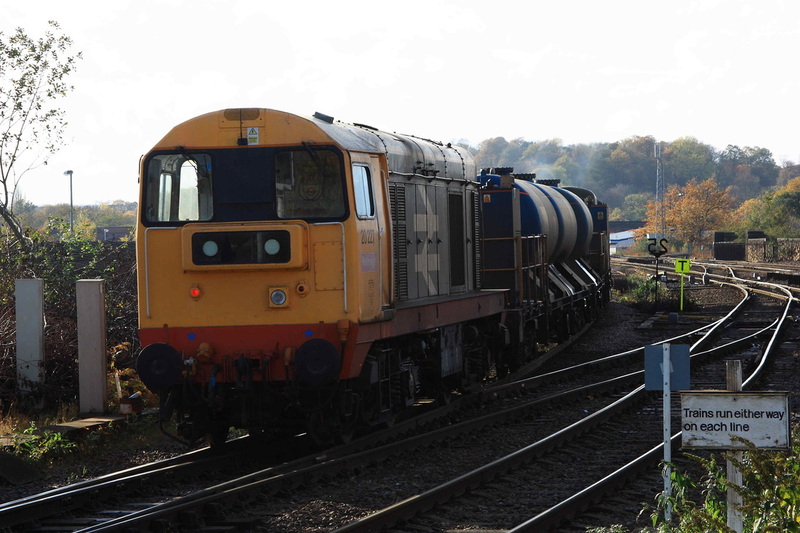 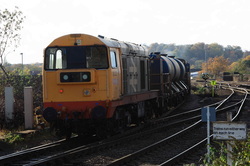 57601 was on the rear for train heating. 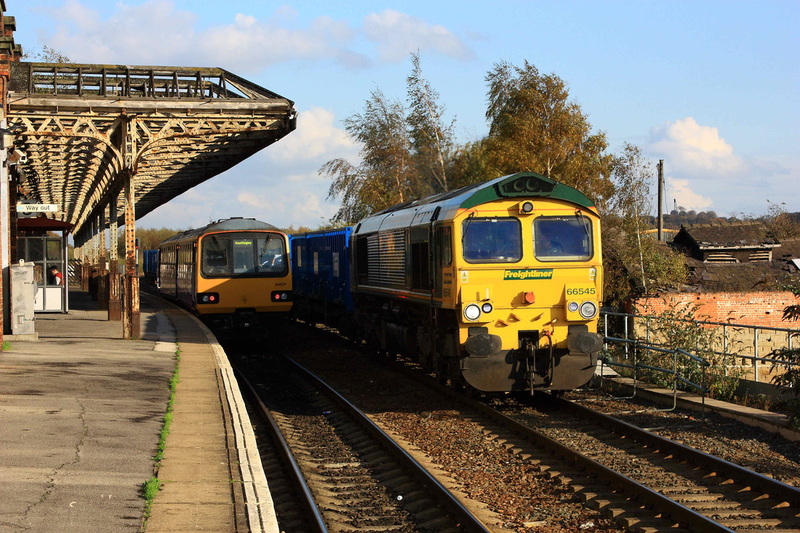 In sunny weather, 20189 leads 3S14 through Wakefield Kirkgate heading for Sheffield. The pair returned through Kirkkgate about 2 hours later in low sun, with 20227 leading this time. 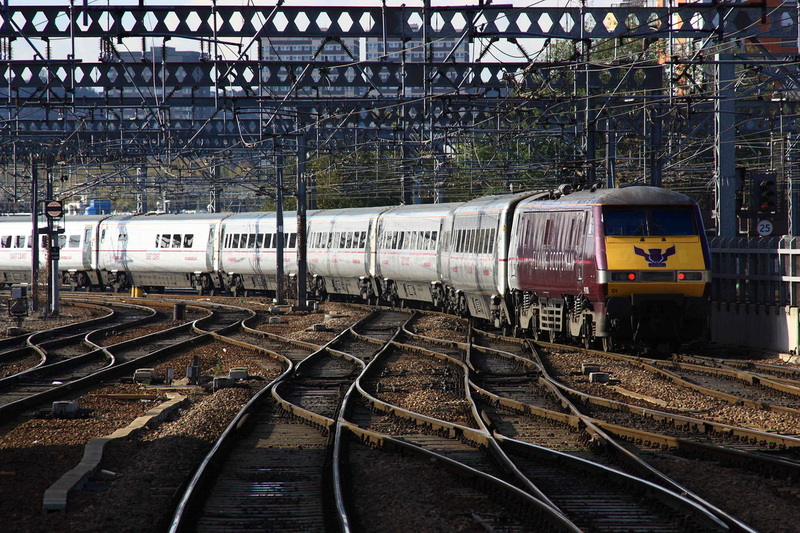 Virgin 57309 heads a Pendolino towards Holyhead. The opposite end of "Demelza"
57010 tops the RHTT from Carlisle via the Tyne Valley and all points east, and back to Kingmoor. 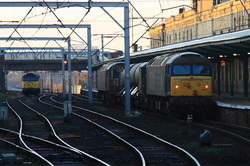 Body snatchers and a donor. 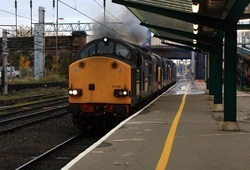 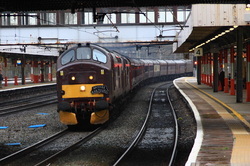 57007 tails 57010 through Carlisle Station on the RHTT.